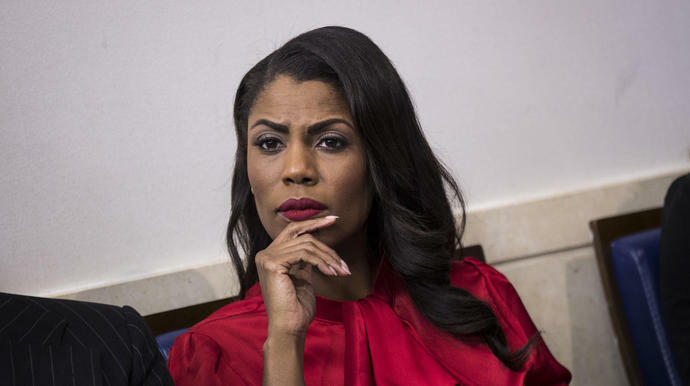 Omarosa Manigault Newman, the former White House aide and onetime cast member on NBC's "The Apprentice" program, continued to claim on Sunday that she had heard President Donald Trump use the N-word. She also said Trump "truly is a racist." Appearing on NBC's "Meet The Press," Manigault Newman repeated that she had heard of the existence of a tape from Trump's days as the star of "The Apprentice" on which Trump uses the racial slur. In her new book, Unhinged: An Insiders Account of the Trump White House, Manigault Newman describes searching for the tape; on Sunday, she said she had actually heard it after she finished writing the book. "Once I heard it for myself, it has confirmed what I feared the most, that Donald Trump is a con and has been masquerading as someone who is actually open to engaging with diverse communities," she said. "But when he talks that way, the way he did on this tape, it confirmed that he is truly a racist." "I was complicit with this White House deceiving this nation," she said. "They continue to deceive this nation by how mentally declined he is, how difficult it is for him to process complex information. How he is not engaged in some of the most important decisions that impact our country. I was complicit and for that I regret." Trump called Manigault Newman a "lowlife" on Saturday in comments to reporters at his golf club in Bedminster, New Jersey, where he is vacationing. White House press secretary Sarah Huckabee Sanders previously characterized Manigault Newman's book as "riddled with lies and false accusations." Manigault Newman's description of Trump as a racist contradicts what she has publicly said before. Shortly after she left the White House late last year, she said Trump was "racial, but he is not a racist." In an interview Sunday on ABC's "This Week," top White House adviser Kellyanne Conway suggested Manigault Omarosa was making false claims about Trump's language in order to market her book. The Republican National Committee also joined in attacking Manigault Newman's credibility on Sunday. In a tweet, the RNC said she has been "exposed as a terrible liar." Manigault Newman was dismissed from her role as director of communications for the White House office of the public liaison in December. On Sunday, she released a recording on "Meet The Press" that she made of her dismissal by Chief of Staff John Kelly in the White House Situation Room. "We're gonna talk to you about leaving the White House. It's come to my attention over the last few months that there's been some pretty, in my opinion, significant integrity issues," an apparent reference to Manigault Newman's reported abuse of the White House car service, Kelly says on the tape. In her comments on "Meet the Press," Manigault Newman said she interpreted other comments Kelly made to her to be a thinly veiled threat. "I think it's important to understand that if we make this a friendly departure... you can look at your time here in the White House as a year of service to the nation. And then you can go on without any type of difficulty in the future relative to your reputation," Kelly says on the tape. I'm curious just how many times Obama used the word "cracker?" And I don't mean the saltines.